Simple, delicious and always a summer favorite. Bring the chicken broth to a boil over high heat. Add the orzo pasta, and cook 8 to 10 minutes, until al dente. Stir in the garlic, and cook until the garlic softens and the aroma mellows, about 2 minutes. Careful not to burn the garlic as it will become bitter. Stir in the basil, thyme, red pepper flakes, and pine nuts. Cook and stir until the pine nuts have toasted to a light golden brown. 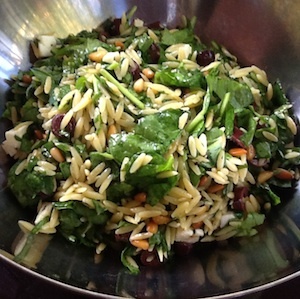 Stir the pine nut mixture into the orzo and add the olives, feta cheese, spinach, and lemon juice. Best served cold, but can also be served warm. Trying adding fresh basil or fresh mint to give a whole new fresh flavour.